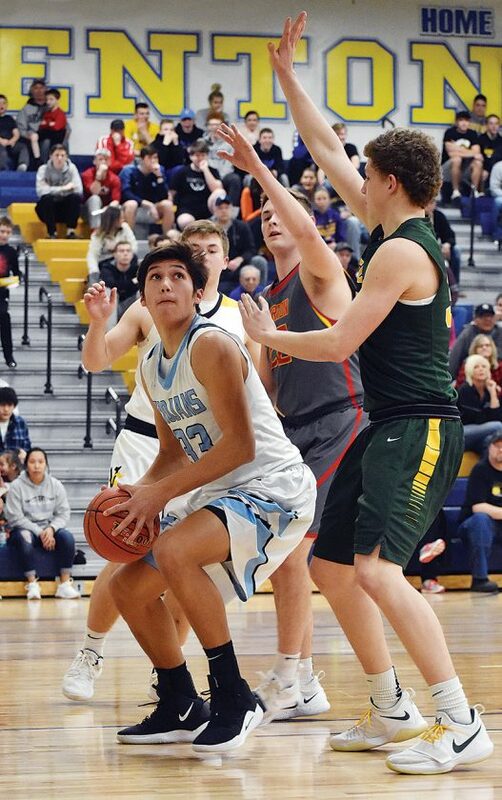 T-R PHOTO BY THORN COMPTON - South Tama County senior Keith Keahna, left, prepares to go strong to the basket against defenders from the East team during the WaMaC Conference Senior Shoot Out at Benton Community on Saturday. Keahna led the West team with a double-double of 20 points and 10 rebounds. VAN HORNE — The WaMaC Conference Senior Shoot Outs might have both gone to the East Division teams on Saturday night at the Benton Community gym, but the South Tama County athletes participating made their presence felt. 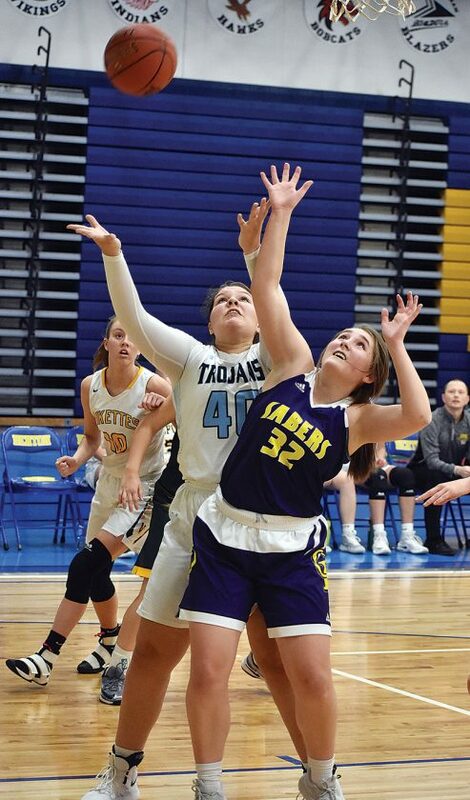 The East girls withstood a late comeback attempt by the West for a 58-53 victory, and it was some late plays by Trojans Jessica Musgrave and Zoee Buffalo that almost gave their squad the victory. Musgrave finished with 11 points along with six rebounds and a game-high eight steals, and even though it was just an exhibition game she said she was doing her best to come out with a win. Buffalo also had a good showing with six points, five rebounds and a steal, and while Jaelin Berger didn’t manage to find the bottom of the basket she did haul in two rebounds. T-R PHOTO BY THORN COMPTON - South Tama County senior Jessica Musgrave, left, shoots at the bucket in front of Mount Vernon’s Sammy Moss during the second half of the WaMaC Conference Senior Shoot Out on Saturday in Van Horne. Musgrave finished with 11 points, eight steals and six rebounds for the West team. On the boys side, the East dominated throughout the game on their way to a 104-80 victory, but there was one player on the West who couldn’t be contained. Keith Keahna had a team-high 20 points for the West, and he also pulled down 10 rebounds for a double-double. After the game it caught Keahna by surprise how much of an impact he had. AJ Becker from Maquoketa was the leading scorer on the boys side with 27 points for the East, including seven made 3-pointers, and Derek Krogmann from West Delaware had 19 points which mostly came from an array of dunks. On the girls side Callyn Fox from Class 3A state champs Center Point-Urbana had 23 points for the game high, while Tara Hansel from Dyersville Beckman was the East’s leading scorer with 12 points. Buffalo, who was locked in some tough battles with Hansel and the other East bigs, said she was happy to get up some shots and contribute to her team. While Buffalo didn’t fit into the scheme run by Stormin’ Pointer head coach Philip Klett, Musgrave plugged right into the defensive system that led to Center Point-Urbana winning a 3A state title. Musgrave was able to take advantage of playing in the press for her eight steals. There were times when all three Buffalo, Musgrave and Berger were on the court together as well, something Berger said she really enjoyed. 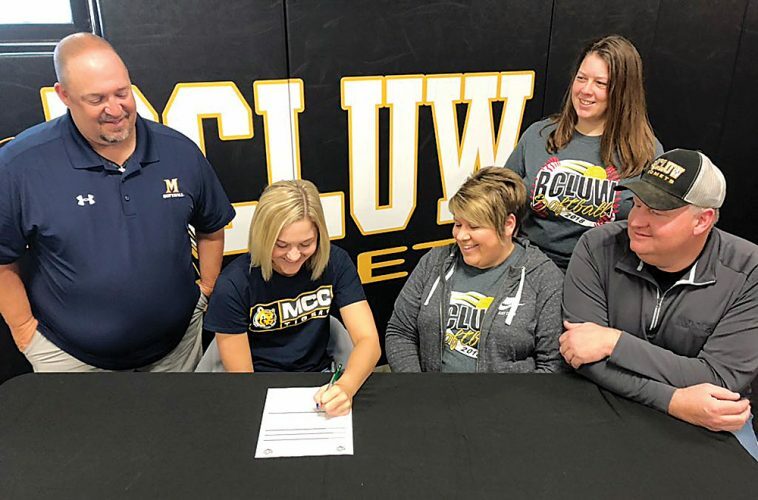 There was the added bonus of playing with the other girls from the WaMaC West, which Berger said she wasn’t sure about at first. 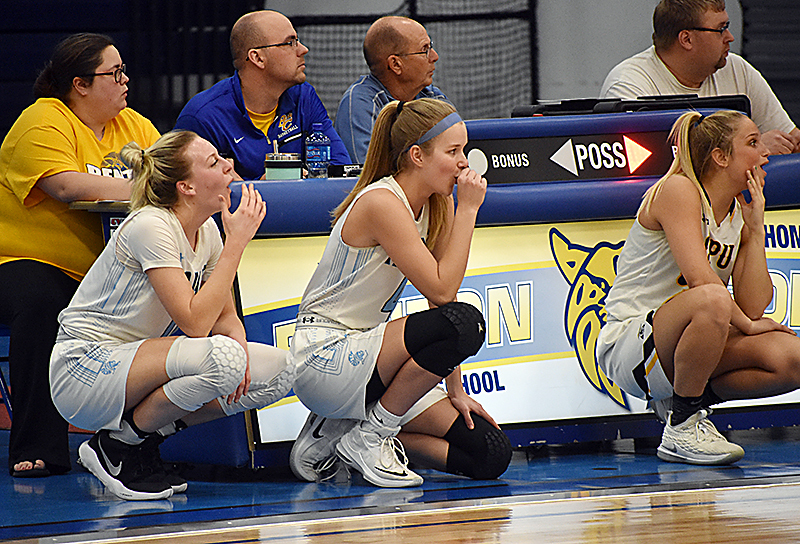 “It was kind of weird, the WaMaC is very competitive and not a lot of teams like each other, but it worked about pretty well and everyone was nice, so that was good,” she said with a giggle. The final opportunity to play with her teammates was what Musgrave said she cherished most in the game. 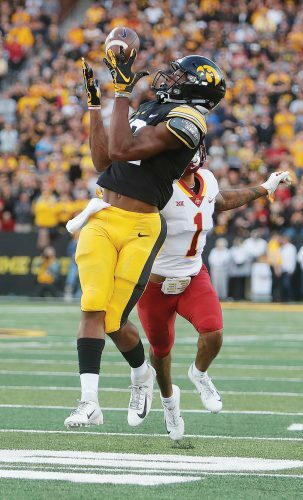 Keahna was the only South Tama boy in attendance, but there was a great crowd there to root him and the rest of the Trojans on, which was something he said will stick with him. “It was a really awesome crowd to play in front of, the whole conference is here and it was really fun,” Keahna said. WEST (53) — Jaelin Berger 0 0-0 0, Karly Millikin 3 0-0 7, Taylor Spies 0 0-0 0, Jessica Musgrave 5 1-4 11, Taylor Wendt 0 0-0 0, Rylee Clark 1 0-0 3, Madie Willson 1 1-2 3, Kasi McWhorter 0 0-2 0, Zoee Buffalo 2 2-2 6, Callyn Fox 9 3-5 23. TOTALS 21 7-15 53. EAST (58) — Ashley Vis 2 0-0 5, Bri Bennis 4 1-2 11, Sydney Arens 1 2-6 4, Sydney Steffen 0 0-0 0, Sammy Moss 3 2-2 8, Emily Swanson 3 0-0 8, Lauren Wisco 4 1-1 10, Tara Hansel 6 0-4 12. TOTALS 23 6-15 58. Halftime–East 29-24. 3-Point Goals–West 4 (Fox 2, Millikin, Clark), East 6 (Bennis 2, Swanson 2, Vis, Wisco). WEST (80) — Isaac Wiley 1 1-2 3, Nolan Schwarting 6 0-0 15, Cam Hasleiet 1 0-0 3, Dylan Spina 2 0-0 6, Noah Haisman 1 0-0 3, Sean Geertsema 5 0-0 12, Cody Westcott 4 0-0 9, Nathan Michels 4 0-0 9, Keith Keahna 8 3-3 20. TOTALS 32 4-5 80. EAST (104) — Kane Kopp 3 0-0 6, Matthew Brase 1 0-0 3, Macklin Shanahan 5 1-2 14, Seamus O’Connor 4 0-2 12, AJ Becker 9 2-2 27, Trevor Paulsen 3 1-2 8, Derek Krogmann 9 1-5 19, Mason Rahe 2 0-0 5, Sean Deutmeyer 4 2-3 10. TOTALS 40 7-16 104. Halftime–East 55-38. 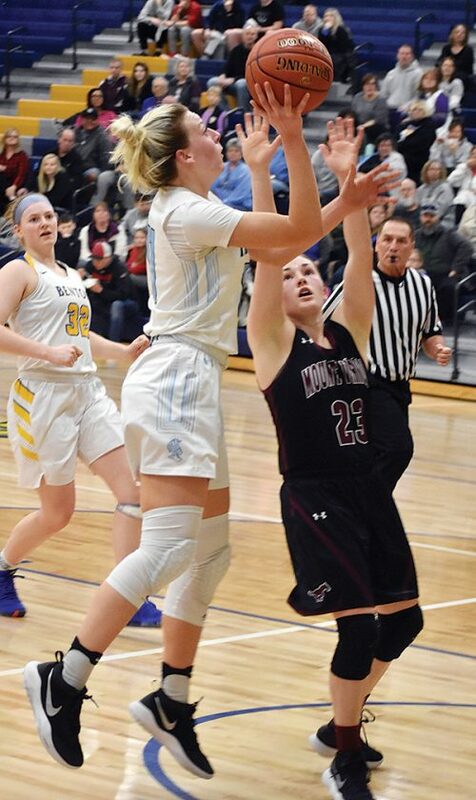 3-Point Goals–West 12 (Schwarting 3, Spina 2, Geertsema 2, Hasleiet, Haisman, Westcott, Michels, Keahna), East 17 (Becker 7, O’Connor 4, Shanahan 3, Brase, Paulsen, Rahe).